I’ve been meaning to try Kate Atkinson for years, ever since her first book, Behind the Scenes at the Museum, came out, and everyone was talking about it. But all her books are quite long, and I never felt sufficiently compelled to make the effort to pick one up. However, with my new not-buying-any-books policy firmly in place as a New Year’s Resolution, I am determined to work my way through my fiction shelves and finally read all the books that have been languishing there unread – in some cases for more than a decade! Kate Atkinson’s Life After Life just so happened to be the first unread book on my alphabetically organised shelves, so down it came last week to have its long-awaited moment in the sun. And am I glad it did, because I found it so addictive that the almost 500 pages just flew by. I feel rather bereft now that I’m finished! The book is centred around Ursula Todd, who is born on a snowy February evening in 1910. In one version of her life, she is born dead, the cord wrapped around her neck. In another, she lives. The baby who lives goes on to grow up in an affluent, middle class home in the idyllic countryside of the Home Counties. A summer holiday one year ends in disaster; Ursula drowns when at the beach. But then the narrative simply returns to 1910, and in this new version of Ursula’s life, someone rescues her on the beach, and her life continues, albeit down a slightly different path. 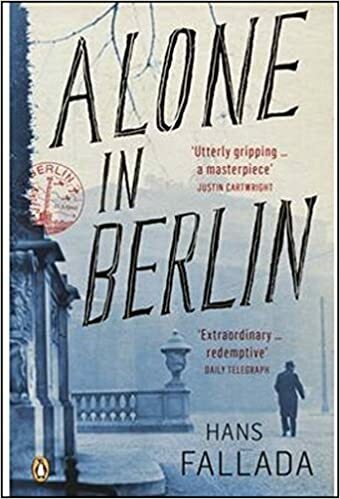 The novel begins with a scene of Ursula in Germany in 1930, shooting Hitler dead; this version of her life doesn’t appear again until the middle of the book, and is dependent on her having chosen to study foreign languages at university. Another version of her life sees her making a different decision, trapping her in a nightmarish marriage in a depressing suburb that completely robs her of her identity. In another existence, she moves to London and lives through World War Two there, in another, she lives through the war in Germany, in another she works until retirement, in another she marries, in another she remains single – and all of these threads remain interconnected, the possibilities of one life becoming another simply a hair’s breadth apart – the choice between buying a new dress or not, going to the shops one evening or not – the most minor, insignificant choices we make on a daily basis shown to be as significant, in some ways, as the major ones, in forming the eventual paths our lives follow. Ursula is a marvellous, vivid character, whose rich inner life and complex relationships with her family members make her various existences endlessly fascinating to read about. It is heart stopping at times to see her walk into disaster, and such a relief to see the darkness fall and know that she will simply begin again, that this doesn’t have to be her life, her ending – there can be a different path. Atkinson is superb at bringing her historical settings to life, and I particularly loved her atmospheric evocation of London in the Blitz, as well as the halcyon, sun-splashed days of Ursula’s Edwardian childhood in the flower strewn meadows of the English countryside. The whole conceit of the novel is incredibly inventive and a constant reminder to us that we are reading a work of fiction – in many ways one can see Life After Life as an experiment in writing a character, in seeing what stories can be made from one persona, and which are worth pursuing and which not – but what makes this truly impressive is that despite the artificiality of its structure, it still gives us characters we can fall in love with, and care for with the kind of unreasonable affection that sees you choking back tears at their fate (I’m hoping that wasn’t just me!). I found it a revelation, and now I can’t wait to read more. Thank goodness for the library, because I’m not waiting a year to be able to dive back into Kate Atkinson’s world! This book was a delight to read! Glad you liked it too. I’ve never read Atkinson’s Case Histories, but the television adaptations with Jason Isaacs are quite enjoyable. ‘Life’ is one of Kate Atkinson’s best books. ‘A God in Ruins’ follows on. ‘Transcription’ isn’t up to the high standard of ‘Life’ but, like all her books is well worth reading. She has such a nice style of writing. It flows, it’s easy to read but never simplistic or patronising. She has the art of writing with a light touch. I hope you enjoy the rest of her books. You have many great reads in store now that you’ve discovered Atkinson! I think this one is probably her best so far (I agree with Richard above that her most recent book, Transcription, isn’t up to her usual standard) but everything she writes is fascinating and well written. Despite not usually enjoying mystery/crime novels, I love her Jackson Brodie books and am very excited that a new one is being released this year. I’d have to agree with both of the above. I’ve read every one of her books and Transcription is enjoyable and worth reading but not quite as good as her others. The Jackson Brodie novels area delight and I thought the screen adaptation was very well done. Great review, Rachel! I’ve been intrigued about reading this one ever since it came out, as I love the concept. But I don’t have it, and it won’t help my reading-from-my-shelves… More gallingly, I used to own Behind The Scenes At The Museum, but got rid of it when I moved, unread. Interesting that so many people are saying that Transcription isn’t up to her usual standard; I’ve just finished it and wasn’t wild about it. But did you hear her on this week’s Desert Island Discs? She comes across as such a lovely person. I couldn’t agree more about Life After Life. It was absolutely addictive and either because of or despite its length, I felt rather disappointed that it ended. Amazing that no matter which course Ursula’s life took, it was mesmerizing, heart wrenching and in character. Thank you so much for this very insightful review. Also, thanks to you I had a delightful time reading all of Elisabeth von Arnim’s books. Long ago I had read Elisabeth’s German Garden, but though I had enjoyed it immensely, hadn’t read any of her other books, til finding your reviews. I loved this one and the sequel. I would love to read more books about this family. And I also read Transcription, but I loved it — I listened to the audio which is brilliantly narrated by Fenella Woolgar. Oddly enough the audio was the first format available from my library so I wasn’t able to read a single word in print (I normally have a print copy as well) so I had to wait patiently for the story to unfold. I wonder if stretching it out may have increased my enjoyment of the book, as I really couldn’t predict the ending.